The only reason I turned down a second visit to Chicago’s Do-Rite Donuts during a recent trip to the Windy City was the awkwardness of navigating the plane aisle with a box of gluten-free donuts. Otherwise, I absolutely would have brought these round pillows of heaven home. Chicago is one of my favorite cities in the United States, and when my wife and I had a chance to take our teenage boys there for a late-summer long weekend, we jumped at the chance. 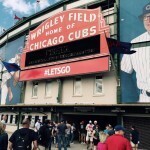 We took the kids to Wrigley Field for a Cubbies game, walked around Millennium Park and Navy Pier, toured the Art Institute of Chicago, and took a double-decker bus tour to explore other parts of the city. But we also spent a fair amount of time savoring Chicago’s fabulous food scene, from the aforementioned donuts to (of course!) deep-dish pizza. You won’t lack for options for gluten-free dining in Chicago. 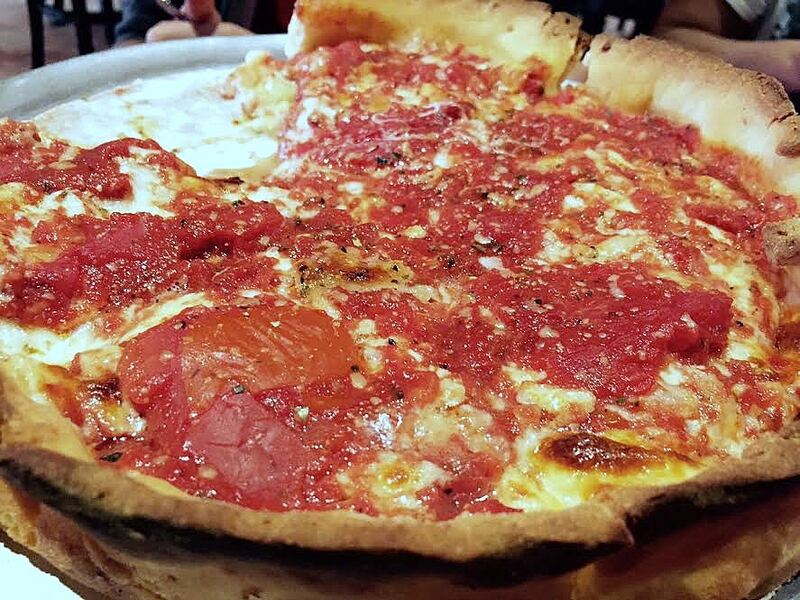 There are several pizza shops that offer gluten-free deep-dish pizza. 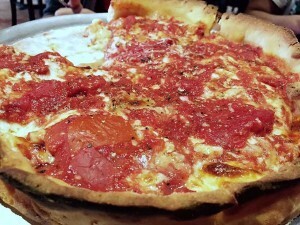 Lou Malnati’s, which has eight locations in the city, makes its gluten-free deep-dish with lean sausage as the crust. the Lincoln Park neighborhood, one of three locations in town). Gluten-free guests there have a choice of three varieties: deep-dish, thin crust and stuffed. The gluten-free dough is made from scratch daily with rice, sorghum and chickpea flours, and the pies are made with dedicated equipment in a separate oven. Our son, who has celiac disease, went for the deep dish, and he wasn’t disappointed. Though the crust is a bit crispier than the traditional version, the gluten-free pizzas are just as gooey and filling. Given its convenient geographical location, Chicago has long hosted national conventions and conferences. With business visitors often comes wining and dining at pricey steakhouses – and there are plenty of excellent ones in town. 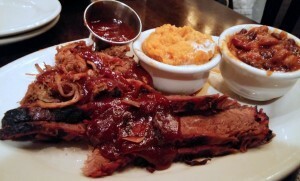 However, one restaurant that is more approachable for those without expense accounts is Weber Grill, where all of the proteins are – you guessed it – grilled on authentic Weber-branded grills. The gluten-free menu includes baked onion soup and grilled honey Dijon chicken skewers, salads, burgers served on Udi’s buns and, of course, steaks. Our son opted for a combo consisting of lean brisket and pulled pork, both slathered in a sweet yet tangy BBQ sauce and served alongside Bourbon baked beans and sweet potato mash. There have been rumors for years that Philadelphia, my hometown, would be getting a Eataly location, and I now see why there’s a clamor for one. What is Eataly? Part grocery store, part restaurant, all Italian. At one of the sit-down dining areas, La Pizza & La Pasta, our son had what he described as one of the best dishes he’d ever eaten. The Bucatini all’Amatriciana, made with imported Italian pasta and topped with red sauce, was dotted with crispy guanciale and spiced with chili flakes. On a return visit, we headed over to Eataly’s first-floor pastry counter. 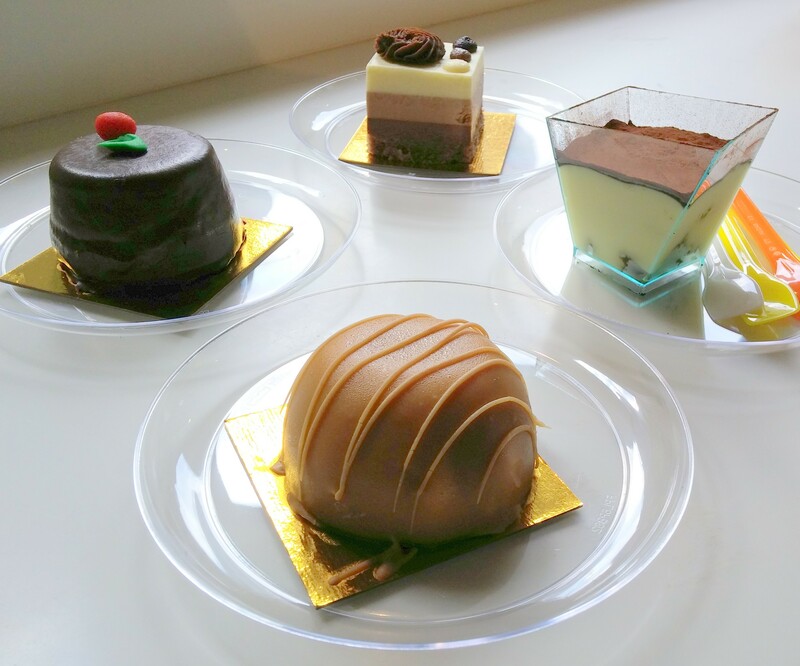 Most of the mini plates – for example, the salted peanut tiramisu and sponge cake topped with layers of dark, milk and Bavarian cream – are gluten free. Because we couldn’t pick just one, we ended up sharing five different desserts. 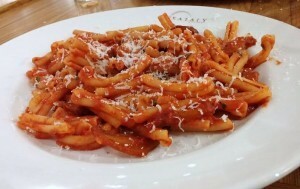 After that indulgence, we browsed the second-floor market and bought several packages of the Garafolo-brand macaroni that Eataly uses for gluten-free pasta entrees. 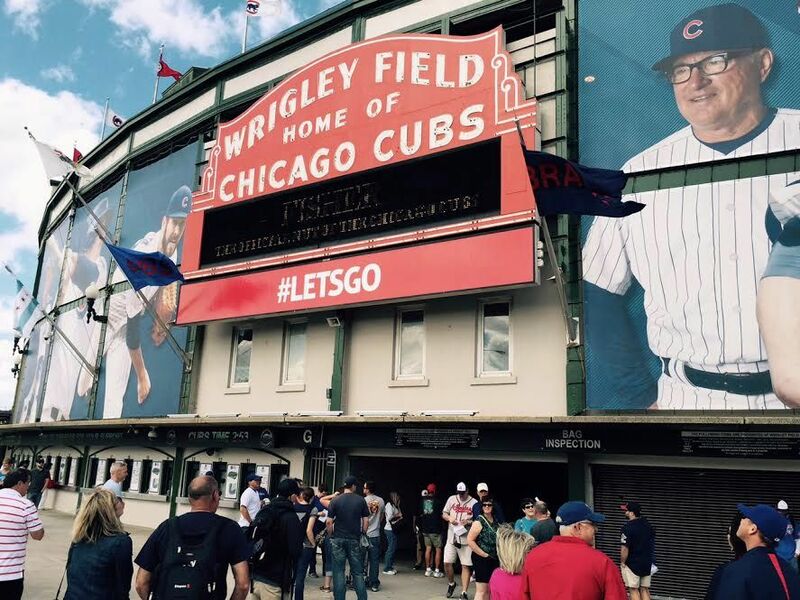 Despite its age, the century-old home of the Cubs, Wrigley Field, has modern trappings. At the Decade Diner near Section 242, fans can order hot dogs and hamburgers on gluten-free buns, and Redbridge beer and Johnny Appleseed hard cider are sold any many concession stands. We didn’t have a chance to eat at any of the more than two dozen Lettuce Entertain You restaurants in Chicago and its suburbs, but nearly all of the company’s brands offer gluten-free menus – from Wildfire steakhouse to Asian-influenced Big Bowl to West Coast-style Summer House Santa Monica. Back to the donuts. There are few cities in the United States where gluten-free eaters can walk into a bakery and get fresh donuts, but Chicago is one. 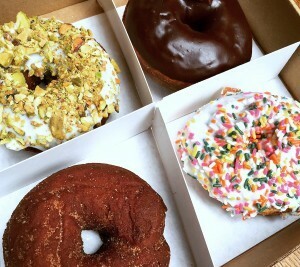 At its two locations, Do-Rite makes its traditional and gluten-free donuts in small batches. The gluten-free versions are made in a dedicated fryer and handled separately. 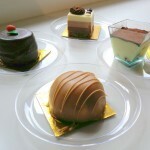 The flavors change daily, but on the morning we went to the original location on West Randolph Street, four different kinds were available: Birthday Cake, Valrhona Chocolate Glazed, Cinnamon & Sugar and Meyer Lemon Pistachio. Once again decision-challenged, we bought one of each and divvied up portions for family sharing. While they were all excellent, the unanimous favorite was the Birthday Cake, which was dense and moist without being cloyingly sweet. Chicago is a modern, beautiful and accessible city that is – weather permitting – the perfect locale for a long weekend. From biking along Lake Michigan to peering out from its skyscrapers among the clouds, tourists have much to do during their stays. That is, if there’s any time left after eating their way through town. Michael Savett regularly contributes to Gluten-Free Living. He also blogs at glutenfreephilly.com.